Welcome to the Scientific Computing and Imaging (SCI) Institute's female head and brain model data repository and pipeline! 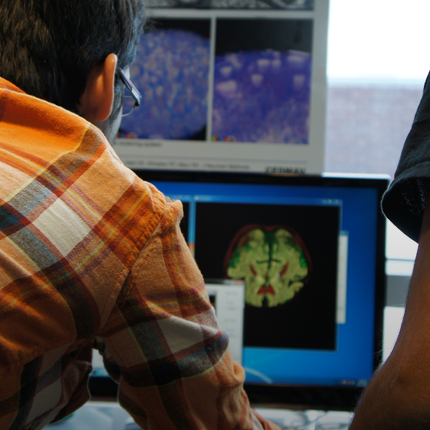 The data repository includes high-resolution T1 and T2-weighted magnetic resonance images (MRI), diffusion-weighted images (DWI), functional MRIs (fMRI), and electroencephalogram recordings. From these images, we created diffusion tensor images (DTI), an eight-layer head and brain segmentation, a 3D tetrahedral mesh in two resolutions, and performed isotropic and anisotropic forward simulations studies. However, this dataset is usable in other areas of research as well. Each data folder will have its own README for more specific details. The SCI Head Model is free and open to the public. All we ask is that appropriate acknowledgements be included in published works when using this data repository. The accompanying paper: "A High-Resolution Head and Brain Computer Model for Forward and Inverse EEG Simulation" contains specific instructions on how to build and use this model specifically for forward in inverse EEG simulations. Imaging and electroencephalography for this project were done at Electrical Geodesics Inc. at the University of Oregon. 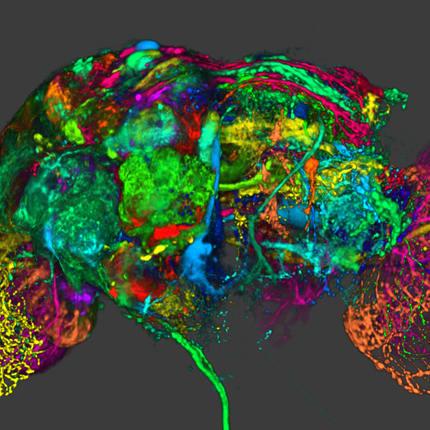 The SCI Head Model is an open-source data repository that is principally funded through the SCI Institute's NIH/NIGMS Center for Integrative Biomedical Computing (CIBC). Please use the following acknowledgments and send us references to any publications, presentations, or successful funding applications that make use of NIH/NIGMS CIBC software or data sets. A. Warner, J. Tate, B. Burton, and C.R. Johnson. 2019. 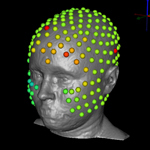 A High-Resolution Head and Brain Computer Model for Forward and Inverse EEG Simulation. bioRxiv doi: 10.1101/552190. 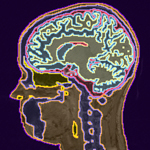 All acquisition reports for T1-weighted and T2-weighted magnetic resonance imaging (MRI), diffusion-weighted imaging (DWI), functional MRI (fMRI), and electroencephalogram (EEG) recordings. Imaging and electroencephalography for this project were done at Electrical Geodesics Inc. at the University of Oregon. 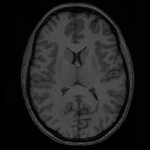 Raw and bias-field corrected T1-weighted MRI in dicom and nrrd format, respectively. 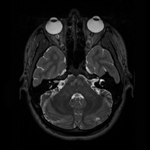 Raw and bias-field corrected T2-weighted MRI in dicom and nrrd format, respectively. Raw DWI in both encoding directions in dicom format. Image correction results from MRIConvert and FSL topup. Corrected DWI in NIfTI format. 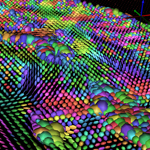 Eigenvalues, eigenvectors, and diffusion-tensor images (DTI) calculated from corrected DWI. SCIRun networks specific to DTI usage, which include registration, data mapping, and visualization of DTI data.. T1 MRI to DTI transformation matrix for rigid registration. 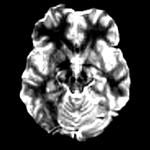 Raw fMRI in dicom format. Image correction results from using the fcon pipeline specific to the University of Utah. 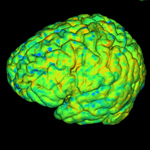 Corrected fMRI image in NIfTI format. Four-dimensional and two dimensional fMRI signal data in .mat format for use in Matlab and SCIRun. SCIRun networks specific to fMRI usage, which include registration, data mapping, and visualization of fMRI data. 128-channel and 256-channel electrode nets EEG recordings. Raw and filtered EEG signal in .edf and .mat formats. EEG signal data was filtered with a 60Hz notch filter and its harmonics. Electrode and dipole locations for SCIRun. 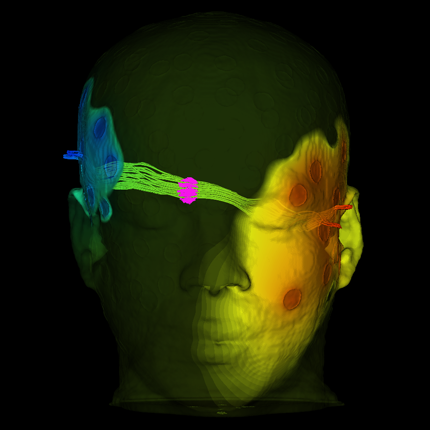 SCIRun networks specific to EEG usage including registration, data mapping, and visualization of EEG data. 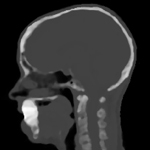 An MR-based synthetic pseudo-CT image, in NIfTI format, generated using an improved iterative version of the patch-based method, as described by Torrado-Carvajal et al., which takes the T1 and T2 images as input and synthesizes the pseudo-CT based on both images, providing more refined bone boundaries. Torrado-Carvajal, J.L. Herraiz, E. Alcain, A.S. Montemayor, L. Garcia-Can ̃amaque, J.A. Hernandez-Tamames, and . . . & N. Malpica. Fast patch-based pseudo-ct synthesis from t1-weighted mr images for pet/mr attenuation correction in brain studies. Journal of Nuclear Medicine, 57(1):136–143, 2016. 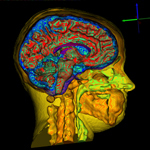 High-resolution, eight-layer, full-head segmentation, in NRRD format, made with Seg3D. Smooth, linear, subject-specific, boundary-conforming, quality, high-resolution, tetrahedral mesh, in two resolutions, made with Cleaver. 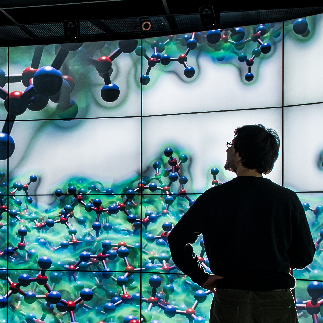 The larger mesh contains 60.2 million elements and 10.3 million nodes, and the smaller mesh contains 15.7 million elements and 2.7 million nodes. 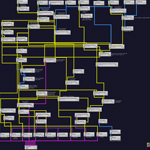 Both meshes are available in the following formats: ele, elem, mat, node, ply, pts, txt, and vtk. Cleaver sizing fields used to generate both meshes. SCIRun networks specific to flat tetrahedra detection in 3D tetrahedral meshes. SCIRun networks for isotropic and anisotropic forward problem simulations.